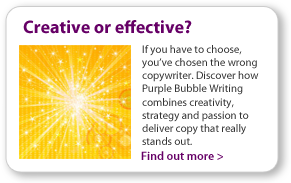 If you usually have to choose, you’ve chosen the wrong copywriter. When I write your copy, I don’t just write pretty words. I imagine it's my own business I'm writing for. Discover how I combine creativity, strategy and passion to deliver copy that really stands out. Researching your company, goals and visions; by working closely with you and your business I am able to produce fresh and relevant content to ensure that optimum business communication is achieved through effective use of words. Asking you to tell me the benefits of your business, why it is unique or better than your competitors, the personality of your brand, the profile of your target audience and their needs and desires and your call to action. Once I’ve put all the pieces together, I am able to see what’s really required and can get on with writing for you. Consistently coming up with fresh concepts; this helps to provide a competitive offering to prospective customers at all times, hopefully leading to a growing client base. My positive work ethic and passion for communicating effectively demonstrates my willingness to engage with and promote your brand and business. Writing creatively and confidently; using my exceptional English skills, flawless spelling and grammar I have the ability to adapt to and influence various audiences. 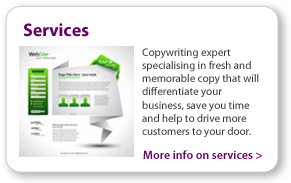 Combining my skills to deliver outstanding copy; my drive and organisation skills mean I have the ability to manage and co-ordinate multiple projects, my copy writing skills mean I can grab the attention of your target audience, while my proof reading and editing skills mean all written content is accurate, truthful and gets the right message across.